Djinn sub-sat is a subwoofer satellite system of Berd Timmermanns, which consists of two satellites and a subwoofer. The satellite Djinn micro monitors can be purchased separately. The subwoofer contains two woofers that radiate in opposite direction. One of the two woofers is controlled by the left side, the other one by the right side. Two opposite working woofer meet the principle of pulse compensation. 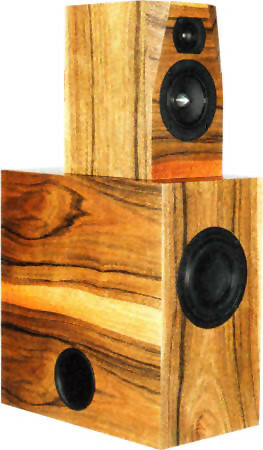 Therefore the two woofers on opposite sides play exactly against each other so that the housing walls do not move contrary to the movement of the diaphragm of the speakers. The frequency response frequency response is flat on axis up to approximately 22 000 Hz. The decay spectrum is without error. The non-linear distortions are less than 1% above 250 Hz and below 0.3% above 4 kHz at 90 dB SPL (1 m). The kit with high-end crossover contains four Mundorf copper foil coils and in series to the loudspeakers Mundorf capacitors of high quality, like a silver/gold/oil capacitor in series to the tweeter.